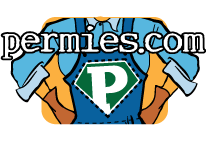 In total I have nine years of gardening experience with five years as a professional. I have a PDC certificate from The Living Centre near London Ontario. I've received two diplomas at Fleming College in Lindsay Ontario: Environmental Technician and Ecosystems Management Technician. Living in an intentional community located in central Ontario, Canada, Zone 5a. Re: Joseph... That's why I lead the IP by saying it won't work for everyone. But I think that it is very applicable to people with backyard gardens, or small scale farmers like me. Even if you're too far from city yard waste pickup, it can work. Some farmers have too much old hay laying around and will deliver it free or sometimes even pay you to take it, for example. There's also lots of unused manure pilez out there in cattle and horse country. As for compost... The amount of compost needed (for transplants at least) would be the same or less than a conventionally made garden bed, would it not? In my experience in conventional market gardens, we would at the very least add 1 shovelful of compost for each transplant. And for heavy feeder crops is it not common to spread compost across the growing area, till it in, and also add a shovelful of compost in the planting hole? Dump 8-12 inches minimum of mulch in 3-4ft wide beds. You can make them as long as you want, and in any shape you want. The mulch should be high in carbon overall (straw, fallen tree leaves, dried grasses) but grass clippings or pine/spruce needles are great to add in small amounts. To plant transplants: put 3-4 rows of beer mug sized pockets of compost/manure for the plants to grow in. Make sure to plant the stems 1-2 inches deeper than the soil level of the pot, so the plant will be less likely to fall over. One planted. Pat the compost down very firmly. You can use that method for planting seeds as well but you can also do it another way: make a thin, 2-3 inch-wide trench in a line down the length of the bed. Fill it with compost/ manure, ideally mixed half and half with soil. Press it down, plant your seeds, press again. For both methods; water if needed. I was able to plant when it was raining or had just rained. I never watered and my yields continue to be on par with a conventional garden. This method will only apply to those who can procure organic matter of the high carbon variety. Basically anyone in towns and cities with yard waste and/or compost pickup, or anyone willing to gather brush, or rake leaves. -when you think you've got the bed high enough...make it higher. -2 shovelfuls of compost is significantly better than one. Go big if you can. This won't work/be practical for everyone but it worked amazing for me. Basically all I did was dump leaves and branches on the ground, inserted 2 shovelfuls of compost where the transplants or seeds were going, planted, and snuffed out weeds by burying them in more mulch. That's it. Didn't water once. Not even at planting time. The only weeds we pulled were from the bad habit of pulling weeds. 90% were simply buried in mulch. Thanks so much! I hope I don't come off like I'm for pictures. I have enough of my own to suffice for a presentation but I want to show different ways that town and city forest gardens can happen, so I thought I'd ask for submissions. A little tip is to cut the bar in half or in thirds so that you can cover more area with each bar of soap. Irish spring is cheap at dollar stores and so is ribbon. To post the soap bars around the perimeter of my garden... I gathered sticks from the forest that were about 4 - 6 feet tall. I used the ribbon to tie the soap bars to the stick, and placed a stick every 20 feet. It's ideal to have soap as close as 3 feet apart but this is unrealistic for any large sized garden. for my nut orchard I plan to place the bars at each tree, because they are planted 40-50 feet apart. Every week or so I'd check the perimeter for fallen soap. Make sure to bury your sticks in as deep as possible. I found 100 grams for $70 in Canada, which at 5000 seeds per gram, would give 500 000 seeds. Ive never had good germination rates with thyme seeds but I haven't tried direct seeding. Plant/mulch them asap! Paths too. 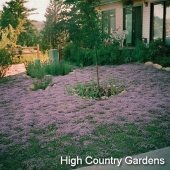 Have you or someone you know successfully established a thick patch of thyme on a lawn or walkway? What advice can you offer? My research says that transplants should be put 6 to 12 inches apart. Seeding your own transplants would be much cheaper. They like a lot of compost, and potassium, so wood ash is good to add. It was also said that if doing a large area, you should start in one patch and take clumps of that patch and expand outwards.